Home Unlabelled Double Happiness - support a good cause with your cuppa. Double Happiness - support a good cause with your cuppa. West Brunswick Community Garden is now a part of a growing network of the Friend of Aileu East Timor Partnership Program. And we've got a tasty slice - selling some of this fantastic tasting, organic East Timorese coffee. Coffee sales through the WBGC help the coffee growers in Timor Leste, and some of the proceeds from every bag sold will go to us at the WBCG. So it's both a delicious brew and good deed all in one. 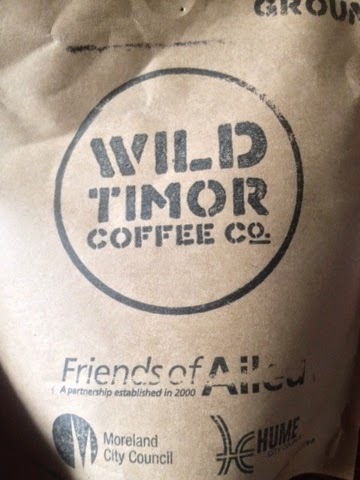 Wild Timor Friends of Aileu freshly roasted weekly, single origin, organic (ground or beans): $12 per 200g pack but also available in 500g, 1, 2 or 5 kg packs (price on request). Our garden member and former Friends of Aileu Project officer Richard is your man. Give him an email to place your orders! He'll work out payment and handover details. In early 2012, four Australian soldiers were sent as part of a peace keeping force to help with the stabilisation of East Timor as part of a long standing friendship between Australia and East Timor which spans back to World War II. After 30 years of neglect during Indonesian rule, coffee that was originally planted by the Portuguese some 200 years ago, was discovered by peace keepers in remote villages, as they patrolled the area. The now 'wild' coffee that grows in the mountain regions of Maubisse and Aileu is thriving. The former soldiers have become loyal friends of the farmers who once fled their crops but are now tending to the coffee. The soldiers have now returned to Australia with coffee from the same plants for everyone to enjoy and also to ensure that their friends in Timor Leste are finally beginning to enjoy the fruits of their struggle for independence and are receiving a fair and equitable price for their product. This is supported and facilitated by Friends of Aileu, a joint activity of the Moreland City Council and Hume City Council, and their communities, partner organisations and supporters; it operates as part of the Councils’ East Timor Partnership Project. Go here to read more. Friend of Aileu are also on Facebook.